Two weeks later we revisit multiplication as we make are way through the 20x20 matrix. The idea is not just to be able to do multiplication with symbols or blocks but to be able to do the multiplication quickly and easily in your head. In order to do this we need to be able to organize our thought and count very rapidly. Manipulatives expedite this. The mind wants to work rapidly. The device it uses is the brain. Brain and mind are not same, just like computation and mathematics are not same. Computation is how we DO math. Mind uses brain, brain does not use mind. But I digress. As I am doing this video I try to impart some concepts not just on the students but on the adult viewers who may be parents or teachers. Concepts like the stages to competence. Do you see the blend of drawing symbols and base ten blocks? Driving home the point that "no" needs to be removed from the lesson. I was going to make the point that they are building neuro-pathways and now that we know some neurophysiology, you understand it takes a little bit of time for the child to form the thoughts and then vocalize them. When they learn new things this takes up a lot of the brain and it takes a few seconds for the brain to process and compute and then make the information available for the mind verbalize. We are faster because the pathways have already been built. We are also going to use repetition to make the information available for instant recall and store it in the long term memory, but we are going to have FUN doing it. No muss, no fuss, no tears, no need for endless worksheets and drill. 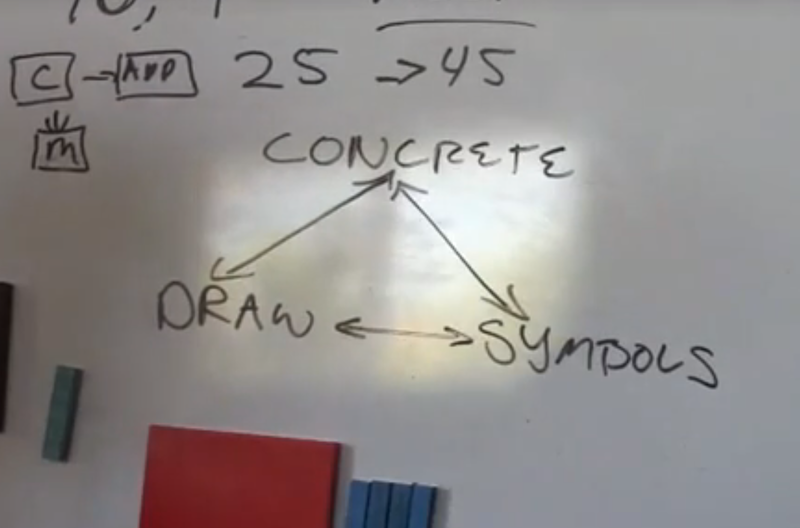 The idea that the partial products model was supposed to be a way to help you count and organize thought and that it was a stepping stone to understanding multiplication and doing it fast was interrupted. Mortensen math uses the term "split and shift" to show this. Manipulatives illustrate partial products superbly, BUT here is a faster easier way to go about multiplication counting the big ones FIRST. Already getting very positive feedback for this vid. People are stunned and amazed because one of the students is "only" six. I make one error in this presentation I expect you will see it easily but it doesn't slow us down or make a difference to the lesson. The blocks show 18x13 when I am doing 18x12 with the symbols. There are a couple of other subtle errors I caught while I was watching this, perhaps if you find them you can put them in the comments below. Lets see if YOU are paying attention, LOL. Problem is, things got a little muddled along the way and many students get bogged down in the algorithm and instead of it unleashing speed it actually hobbles them. As you can see I am training them to go left to right. Count the big stuff first, understand that we're counting hundreds then tens and then units...adding them up is SUPER EASY IF you understand your addends. The youngest boy needs some practice with addends. He is going to build pyramids NOT do worksheets. Since this first post we have maybe practiced this for an hour over two weeks. Maybe. There has not been drilling or worksheets, there has been some play (playing algebra and building math towns and such) and some practice. Soon we will make a game of practicing all 400 facts. Note the order...first we get single digits facts mastered. Then we do the single digit times two digit facts. WHILE we are doing this, we have been building squares all the way out to 20x20. This helps us practice addends, addition and single digit multiplication. We have played with 11's (and nines) so those are easy. Also played with 12's. As we do this we are now also doing two digit by two digit which of course includes square numbers, 11's, 12's and the "easy ones where the tens addends add up 100, which are 11x19, 12x18, 13x17, 14x16 and 15x15. We can play with the little one like 12x13 and all those where there are no tens "hiding" first. These are great for building confidence with the little kids because it makes them feel like they are doing big kid math. Concurrent and compounding lessons make all the difference. Note that concurrently with learning addends, addition, and multiplication they are learning algebra which reinforces this...and also fractions, percentages and problem solving. You will also see compound lessons on square root and and the concept of square numbers tossed in as a matter of course. I think you will agree they are making fine progress. And this is the way it works first you crawl, then you walk then you can jog and pretty soon you can run where you used to stumble and fall. I hope you can hear the excitement. So much energy that many times I don't get to complete my thoughts...math learning should be FUN not done in silence to the scratching of pencils. Raymond has his own page where you can track his progress. But you need a password. Great page if you have a five six or seven year old. Sarah's is a good page to visit if you are dealing with Autism. There are also tons of sample lessons and videos (free and password protected) on my site, and please come join me on Face Book. Anybody with a Lifetime Password gets the password to this and a download automatically. (Told you a life time password would pay dividends down the road and there's plenty more to come). FOR 15 bucks you'll get over 2 hours of training like you see here and some more pages and videos that I think are especially pertinent that are out there lurking on the web for FREE that you just might not have seen or found yet but the training you see here won't be available anywhere else...except for maybe Pirate Bay after I make the DVDs. Further if you want physical product after that you can get that too just pay "shipping and handling". THEN for the next 50 the price is 19.99...but no second password but if you want the physical product just say so and I'll ship that to you no extra charge. After that the price will be 19.99 for the download/single use password and 24.99 for the download and the physical DVD. Then maybe I'll do a subscription where once a month or so you get another DVD...also eventually I will get an outline and edited transcript done, and that will be part of the package. Also I plan to "gussy up" the video with some editing and captioning before it goes to the physical DVD stage...and hopefully before it goes up on my site for download too, but a lot of people want it NOW never mind the polish...of course you can have both if you in the first 100. Also a lot of people are going to get the download for FREE, like I said those who are in the early adopters club and any parents who have paid for tutoring...I think with the DVD and transcript plus notes (eBook and physical) it'll be well worth the money. If you disagree say so in the comments. If you are new around here, here is an Hour Long Intro and a bunch of other vids. This is good "training" in and of itself. FREE. Then here is a Getting Started Page. It's for the Deluxe Curriculum Starter Kit but it certainly applies if all you have is a combo kit or just some blocks you got off ebay or whatever. Be sure to download and read the pdf's there. Still FREE. People are amazed at my site and all the stuff they get for free...there's even free worksheets (which you are to use SPARINGLY) then they are even more amazed when they cough up a few bucks for a password and see all the stuff they get there. 25 bucks is damh near free when you consider the thousands (and thousands) of bucks I spent traveling to Idaho and bringing Jerry to Maui and and and to get trained because there is very little good training on base ten blocks out there for free or for money. If you find some let me know...put links in the comments box. I aim to be the best. I'm not there yet but I'm going to be. Here is a lady I liked a lot who was trying to show you didn't have to buy expensive blocks and kits and such; just use what you already have over on Vimeo. She re-made some of my videos except she used her (exceptionally cute) daughters which may be better for those of you with little girls so your daughters can relate...you'll notice I made a few comments on some of her vids. Patterning With Base Ten Blocks And 11's. Here is a lesson where we basically play spot the pattern. 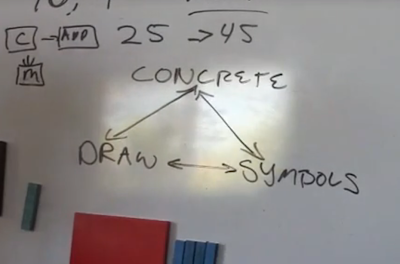 We start off with base ten blocks and very quickly move to symbols only; however, this lesson does answer a lot of questions with regard to WHY some of the "tricks" with 11's you may have learned work the way they do. This why we like math, the patterns are easy to see, the rules are consistent, you can prove your answers...but don't get caught up in the rules and theorems. Play and put the children in a place where they can discover the rules for themselves. Once they see the patterns they can often make up their own rules and then test them to see if they always work...if you do it right they will tell you the Pythagorean theorem you don't have to tell them. This is just more of that. This is a simple lesson just playing with 11's. You could play with 9's (← note those are 1st graders in a classroom) or other numbers just for the fun of it. If the child is curious and having fun the lesson is much easier. We went pretty long considering it was just on 11's but they were fairly well engaged for more than a half hour. In this lesson they got to practice their addends again, and do some addition and use their counting skills creatively and learn a little about patterns. More fun to be had at Crewton Ramone's House Of Math. Manipulatives For Two Digit Times One Digit Multiplication. At Crewton Ramone's House of Math we don't just get multiplication through 9x9 down, we go all the way out to 20X20. Notice I say "get it down" not just memorize. Manipulatives make multiplication easy, so easy, ans so fast that it will look like they have it memorized even if they have to do a little calculation in their heads...with enough practice they will memorize their multiplication facts but instead of it being difficult and hard we make it fun and easy. In this lesson they learn and practice several things at once. If you watch the video below you can see why I spend so much time on addends. Addends are important. This lets them practice their addends WHILE they do multiplication like the big kids. No worksheets. No symbols to start with, just play with blocks and have fun, let them build the problems. Don't tell the youngest kid but I was teasing him a little bit by telling him this stuff was "too hard" for him. SO of course he wants to show everybody he can do it too...and he does. (Proper motivation works wonders. You need to be smarter than your six year old.) Any little kid can do math especially if they speak English. On this blog and on my website I try to show you their best use. The seven year old kept confusing multiplication with addition and wasn't always sure which numbers to add when he was just looking at the symbols. He was also over thinking it and getting ahead of me because he knew there were more than just 3 tens in (17)(3) = 51 and that there were 5 tens not just 3. But I was asking him to count the blue ten bars not the ones "hiding" in there with the sevens. Note how the younger boy wasn't even thinking about the tens hiding with the sevens he just saw the 3 tens, and the oldest boy knew what I meant. He understood I was going thru the problem in parts. If you listen you can hear the development differences between the three boys. They also get different problems for their skill level but the basic concept is the same throughout. Don't lose track of the idea that the concept remains the same the numbers just change. 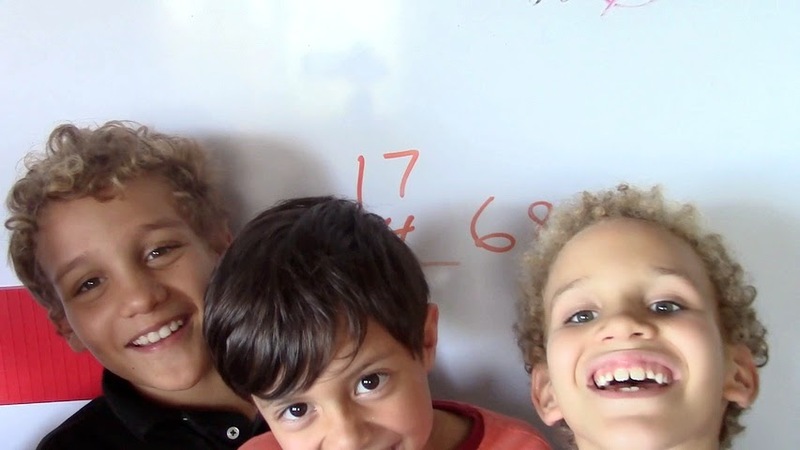 I use smaller numbers that require less counting for the younger boys and bigger problems for the older boy, but very soon they all can do any problem...they just need more practice with single digit multiplication but it doesn't stop them from doing this in fact this teaches them that. I also want to point out we are practice skill sets not drilling. There is a difference. We also talked about multiplication being addition...you just do it over and over again. 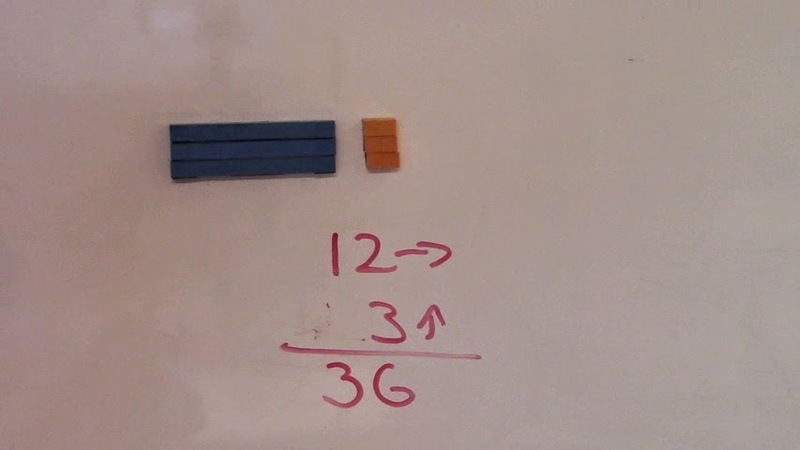 They get to practice and learn their multiplication AND addends, I try to make this blatantly obvious during the video. Again: one teaches the other and visa-versa: you don't have to have all your addends memorized before you can do this this will help you leran them, neither do you need to have all your single digit multiplication facts memorized before you can do this, this will help you learn those too...especially when you are playing with the blocks. It also just makes it natural to see you are adding the tens plus whatever the units are. 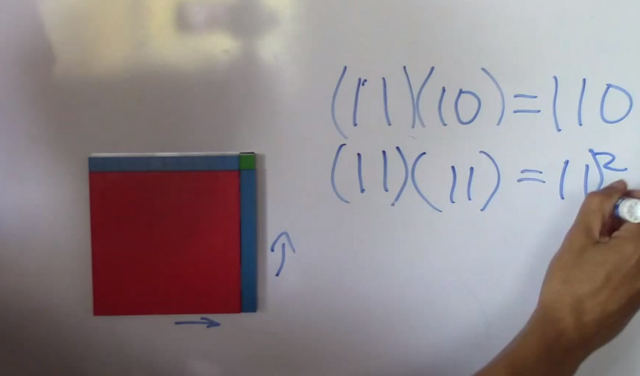 Basically just adding two rectangles, in the case of (17)(3) = 51 you are adding 30 plus 21 they can SEE it. Also note that even though you can't see them it sounds like they are having fun, because they are. Laughter should be a part of math, it's fun when you get it right, it feels good. I see so many math classes where they are forced to do worksheets in silence. Or where they are expected to learn in SILENCE. 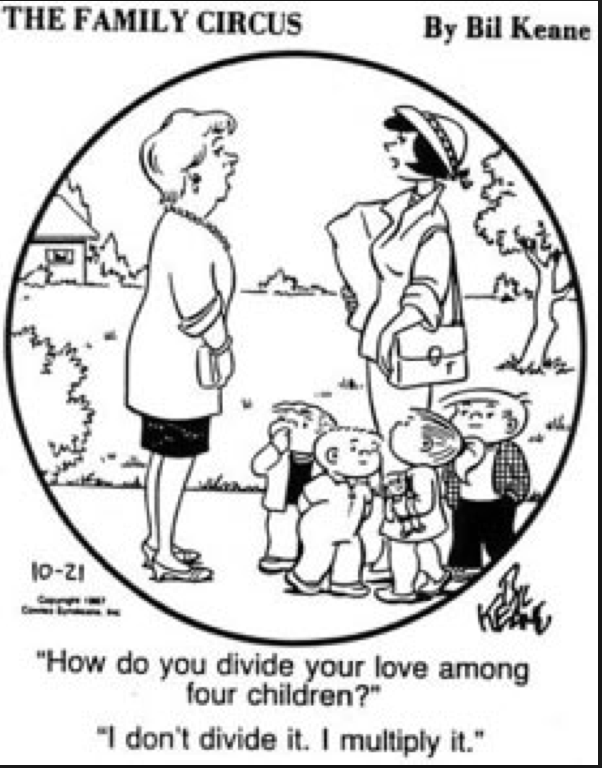 Why not make math fun? Notice that pretty soon we are just using symbols, no blocks but after the lesson on vid we went back to using blocks, this was just a demonstration for YOU the viewer. We've gotten so poor at teaching math public schools can barely get them to memorize the 9x9 matrix, that's only 81 facts, we are on our way to memorizing 20X20, that's 400 facts. Addends are not just "kinda important", they are crucial. Same with multiplication. Addends make multiplication easy and multiplication makes ALL the math easy because it allows you to count quickly, see patterns, find common factors and more. I can't stress enough how important it is. There are those who say we don't need to learn our multiplication tables because calculators are so ubiquitous...the problem with that is kids hit 7x6 when they mean 7x9 because the six is right under the nine and it's easy to miss or "fat finger it" and they don't even notice. There's a big difference between 42 and 63, but they don't have the number sense to catch the mistake. Can you think of the reason we count the tens first other than that it makes it easier? Go to Raymond's Password Protected Page. "You save an old man and you save a unit; but save a boy, and you save a multiplication table." "Time neither subtracts nor divides, but adds at such a pace it seems like multiplication." 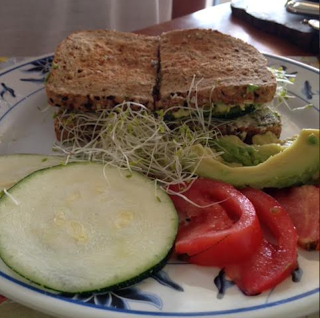 Crewton Ramone In The Kitchen: Veggie Superfood Sandwich. In whcih we answer the question, "what do you feed those boys of yours?" Oh look! More pics of food. Here is a short video showing the making of a simple sandwich with Dave's Killer Bread, sprouts, raw zucchini slices, sliced tomatoes, chia, cracked hempseed, a little brewer's yeast, a little butter and some 5 onion spread...plus a little home made fresh soft cheese made from whole raw milk. Put it together so the seeds don't fall off and stuff it in your face. All the stuff you see here went into the next sandwich. 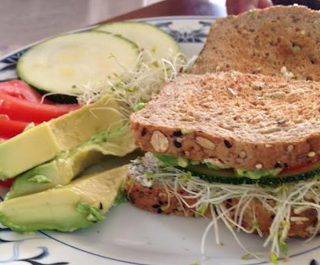 Healthy food = healthy brain function, so you can do math. 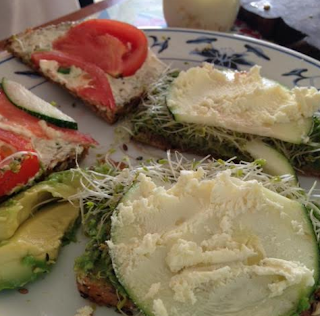 You can eat the ingredients one at a time or combine them to make delicious sandwich. I like to toast the bread just a bit but you don't have to. If you are a strict vegan it should be pretty obvious which ingredients to leave off. I am neither a vegetarian or a vegan but most of my calories come from fruits and vegetables, seeds and grains. The bread is made with 21 whole grains. 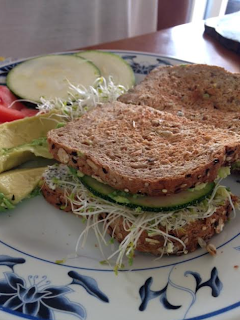 Almost all of the ingredients are considered super foods, the sprouts, and chia and hempseed are super foods you may or may not have heard of, but do a quick search with the term zucchini super food. I was surprised to find out it was considered a "super food" too...despite their creamy interior color zucchini are one of the best sources of carotenoids and other vitamins, making them a nutritional powerhouse." Read more here. "High blood levels of carotenoids, including lutein, are associated with decreased risk of a number of different cancers including cervical, kidney and colorectal. Lutein in particular is associated with reduced colorectal cancer and may be protective. Zucchini is also an excellent source of manganese, potassium, vitamin C, vitamin B6 and riboflavin. Interestingly, many of the beneficial antioxidants found in zucchini are more readily absorbed in the body when the vegetable has been cooked." Add lightly cooked zucchini slices on this sandwich sprinkled with Spike; it would be REALLY good, but I didn't want to spend the time. Sometimes fast and easy is better, but if you have the time you might try it. Chia is considered one of the ULTIMATE super foods. If you are not familiar with it do some reading. Same with hempseed. Chia is a complete protein which means it contains all the amino acids essential to us humans. It's low glycemic index is great, and that means it has a negligible effect on insulin levels, it’s also hydrophilic, it absorbs 10 times its weight in water–a low-calorie food that is filling because of its volume. It’s rich in B vitamins, iron, calcium, zinc, fiber antioxidants and the anti-inflammatory flavonoid quercetin. Read up on all the studies done on quercetin. I could have sliced the tomato better but it worked. I bet you can do better. Here is a shot of the sprouts and spread...the spread is made locally with fresh ingredients and no preservatives...5 different kinds of real onions. Real Sour Cream, real cream cheese. I know the family that grows the sprouts...they are not certified organic but I've been to the farm; they don't use chemicals (no pesticides or herbicides) getting certified costs too much I guess. It's a Maui farm and the owners understand the concept of healthy food. 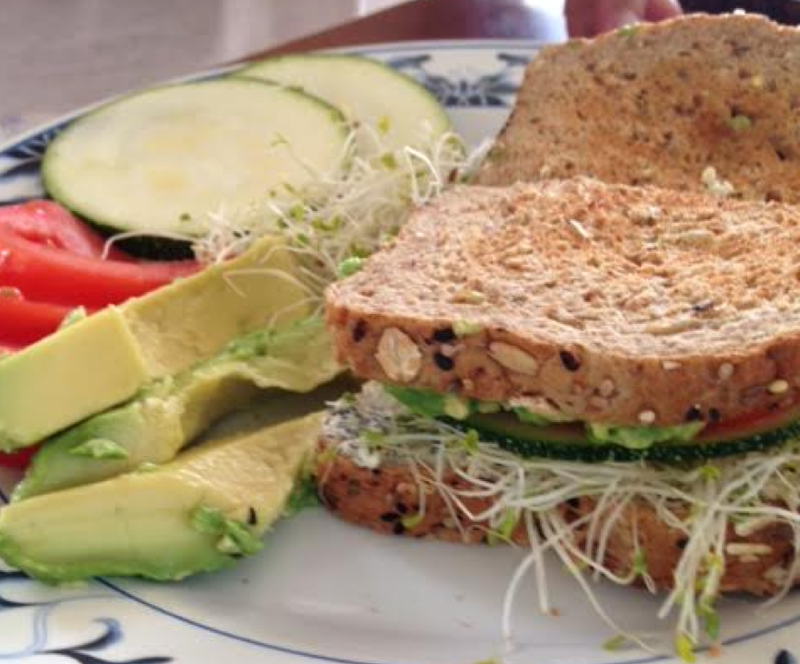 If you do a quick search on each of the ingredients you will see that this simple sandwich is a nutritional bonanza....and it's also super tasty! Healthy food should taste GOOD. Nothing worse than having to choke down food that is supposed to be good for you but tastes terrible. This sandwich is kid certified...my sons are not particularly fond of watercress but if you stick it in this sandwich they eat it no problem. I would have, but the store I went to was out.